It's such a peaceful day in the woods. The birds are chirping, the animals are frolicking, and Red Riding Hood is looking for her next victim to chop into little pieces. Oh and there's some creepy guy chopping the heads off bunnies. 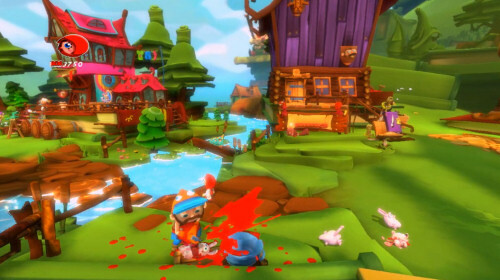 The latest trailer for the two player co-op Fairytale Fights has been released, and in it we get a glimpse at the over the top gore the game provides. I almost think this game derived from an office joke that has gone too far, and then went a step further. We'll be seeing a lot more of Fairytale Fights in the near future as it approaches the Holiday 2009 release on the 360, PS3 and PC. You might want to advert your kid's eyes - there's a lot of Play-Doh-esque blood in this one. Page created in 0.6573 seconds.